Contrary to popular opinion, nuts are a fat-dominant food, not a protein-dominant food. Nuts and seeds can comprise part of the daily diet, however they should be eaten in reasonable quantities (a maximum of 0.33 pounds or 0.15 kg per day). 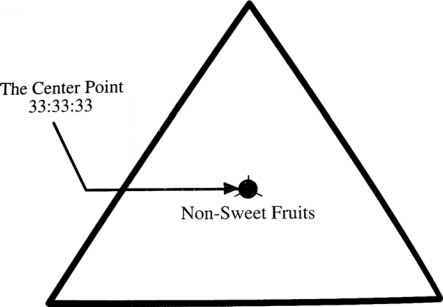 Remember they are negative karma foods. If overeaten, they should be balanced with green-leafed vegetables and juicy sweet fruits. It is best to eat nuts moderately - ration them and do not eat more than you set aside for yourself. It is easy to overeat nuts and eat them too fast, especially if you purchase them unshelled. Every couple of months I like to rest my body from nuts for a week or two. Because nuts are so concentrated, they should always be eaten with or just before a large meal of green-leafy vegetables. Some of the best nuts include almonds, hazelnuts, macadamia, pecans, pistachio, walnuts, and pine nuts. Macadamia nuts are the best nuts of all because they have the most fat and the least protein of all nuts. However, macadamias can be mucus-forming unless eaten with a significant amount of green-leafed vegetables. Cashews have a shell filled with a thick black resin that makes cracking the shells, for the most part, unmanageable. Thus, cashews are cooked out of their shells. Even if they are labeled "raw," they are actually cooked (I did not like finding this out when I first discovered raw foods, but I eventually got over it!). Tree nuts are also potentially mucous formers. If you eat too many nuts, you may find that clear mucus will flow from your nose. This is because nuts are acid-forming in the body. A mucous discharge is a way for the body to dispel some acid-forming minerals and create a more alkaline internal environment. Eating the alkaline-forming green leaves counter-balances the acid-forming elements in nuts, eliminating mucous discharges. If you eat nuts in moderation and eat nuts with green-leafed vegetables, then you need not worry about soaking or mucus formation. A strong digestive tract, strengthened by months and years of eating quality high-fiber green vegetables, is capable of digesting nuts with little difficulty. Quantities should be kept to less than 2.0-2.5 pounds (0.9-1.2 kg) of nuts per week. I recommend nuts over seeds because they have a higher fat content. And nuts with the highest fat to protein ratio are best of all. If not eaten fresh from below the plant or tree, you might consider soaking nuts and seeds in water and/or sprouting them for 3-12 hours to disarm their enzyme inhibitors. Enzyme inhibitors keep nuts and seeds in their dormant state until conditions are right for growth. If eaten in the dormant state without green leaves to help along digestion, nuts and seeds can burden the pancreas and sit "heavy" in the stomach. 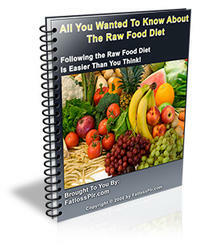 Raw food diets can be great way to not only lose weight but also led a much healthier, natural lifestyle in general. Most raw food diets are plant based with at least 75% of the diet composed of raw food.